England. Anne (1702-1714). Pre-Union coinage. 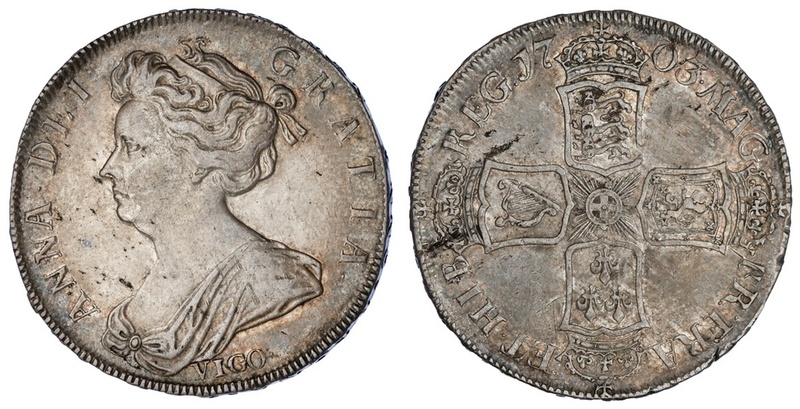 Halfcrown, 1703. VIGO. Draped bust left, VIGO below, rev. Crowned cruciform Arms, Garter at center. Struck from bullion seized in Vigo Bay during the Anglo-Dutch expedition against Spain. S.3580, ESC 569, KM 518.2. Some reverse rim nicks and minor flan flaw. Toned. About Extremely Fine.